The company’s new Yoga tablets, which will come in 8-inch and 10.1-inch versions, will provide 12 to 14 hours when watching high-definition video, said Stephen Miller, Lenovo ambassador. The tablets were announced at a launch event in New York. 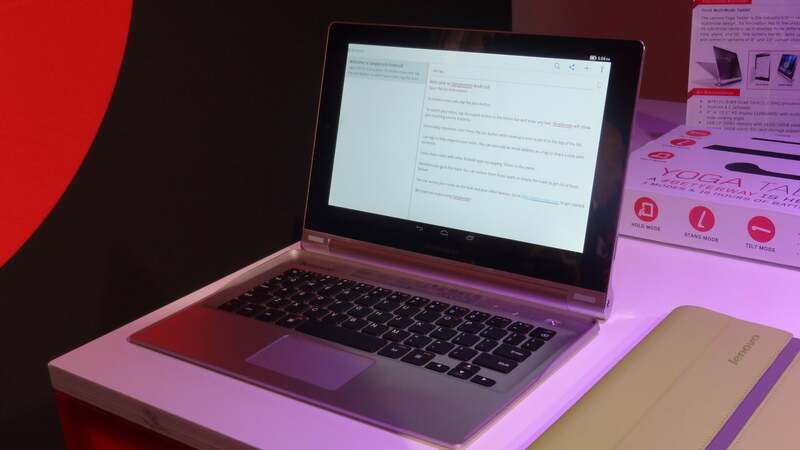 If Lenovo’s claims of battery life hold up, the Yoga tablets will beat competition handily. Tablets today are at best able to squeeze up to 11 hours of battery life. The Yoga tablets have high-capacity cylindrical batteries similar to ones used in laptops, which helps prolong battery life. The 8-inch tablet, which is priced at $249, weighs 400 grams. The 10.1-inch tablet is at $299 and weighs 603 grams. The tablets will run Android 4.2 and be available in the U.S. on Wednesday. The company did not comment on worldwide availability. The battery is housed in the tablet’s circular base, which makes it easier to grip the device. A kick-stand allows the tablet to sit firmly on the table. With a circular base, the Yoga tablets bears a resemblance to Notion Ink’s now-defunct Adam tablet, which was one of the first Android tablets to ship when it became available in late 2010. “We shipped more smartphones and tablets than PCs,” during the third quarter, Miller said. Updated at 12:35 p.m. PT with a video report from IDG News Service.